In this rare display of his watercolours and drawings, Miller’s Penguin covers are closer to still life studies, rather than two-dimensional posters. Experimenting with different paper sizes and angles, he occasionally shows their spines, and the shadows they cast. It is a celebration of books as treasured objects. His drawings – in particular his studies for his large-scale oil paintings with their notes scribbled down the margins – are some of his most intimate works to date. 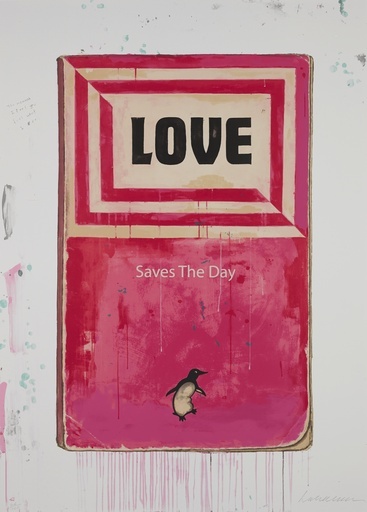 Writer and artist Harland Miller (born 1964) is known for his large-scale, playful re-workings of Penguin book covers. He explores the relationship between words and images and the process of producing meaning—in his paintings, sculptures, and mixed-media works. Interested in canonical authors like Edgar Allan Poe and Ernest Hemingway and drawing influence from Ed Ruscha, Mark Rothko, Anselm Kiefer, and Robert Rauschenberg, Miller pointedly combines text and images to comment on the frequent disconnect between representation and reality. In 2001 Miller produced a series of paintings based of the dust jackets of Penguin books and found a way to marry aspects of Pop Art, abstraction and figurative painting with his writer’s love of text. “I remember my parents’ Penguin books. For me, they are about nostalgia for a by-gone era – that musty smell, those coffee-mug rings, the often heart-breaking inscriptions on the inside cover.” Miller has lived and worked in New York, Berlin and Paris. Born in the North of England in 1964, Miller’s fondness for the drizzle and grimness of those northern towns remains a strong theme in his work. “I suppose mine is a very English sense of humour,” he says. Harland Miller was born in Yorkshire in 1964 and lives in London. Group exhibitions include Royal Academy, London (2006, 2005), Kunsthalle, Mannheim (2004) and the ICA, London (1996).